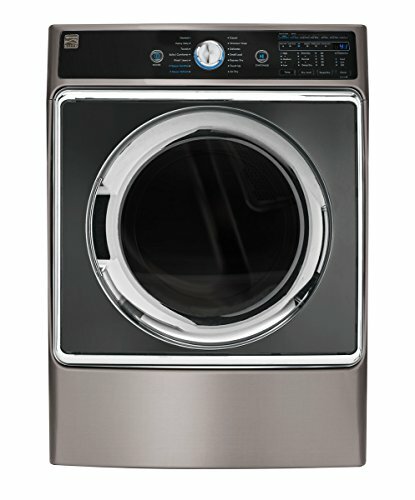 Give your clothes the care they deserve while making wrinkles a thing of the past with this Kenmore Elite Front Load Dryer with Wrinkle Guard. Premium features include Sensor Dry which detects moisture and applies just the right amount heat and time to prevent over-drying while saving energy; Steam Refresh which removes wrinkles and reduces odors in just 10 minutes for fresh clothes and no ironing; and Sanitize cycle which eliminates 99.9% of common household bacteria, great for bedding, children’s clothing, and non-washable items like pillows and plush toys. Additional premium features include Static Shield which eliminates the need for dryer sheets, and Express Dry to get sports uniforms and lightly damp items dry in a hurry. With 14 cycles to choose from and the extra-large 9.0 cu. ft. stainless steel drum, you’ll conquer laundry day quickly so you can get back to the fun things in life. Sensor Dry with dual sensor technology detects the moisture content and stops the cycle once the selected dryness level is reached, preventing over-drying and additional wear-and-tear on fabrics. Sanitize cycle eliminates up to 99.9% of common household bacteria with the use of chemicals, perfect for bedding, children’s clothes, and non-washable items like pillows and plush toys.